Most of my friends think I’m an awesome cook. But I have a secret for them: really, I’m just an awesome shopper. Memorable meals are all about the ingredients, whether they be incredibly fresh, unique, difficult-to-find, expensive, local, organic, or exotic. As long as you make an effort to find excellent ingredients, all you have to do is follow a good recipe to produce an impressive meal... and anyone can follow a recipe! Most of my dinner parties follow a regional or ethnic theme. I thought I’d share with you my sources here in Jacksonville for the specialty ingredients needed for a recent Thai dinner party. 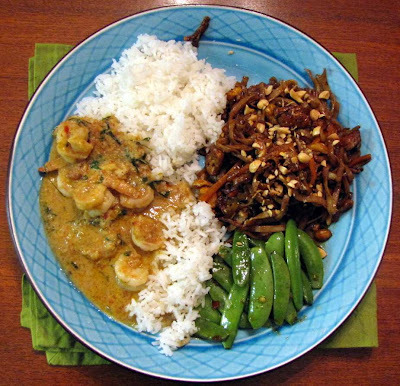 The menu included Penang chicken curry, a spicy dish with a coconut-based sauce; vegetarian pad thai, a sour-sweet-spicy-salty noodle delight; stir-fried sugar snap peas with shrimp; and steamed Jasmine rice. For dessert, we had coconut ice cream with mango and a warm ginger sauce. All of these recipes are ideal for a dinner party. As long as you make your curry pastes and sauces and do your prepping and cutting and slicing ahead of time, you can quickly pull everything together in about 20 minutes right before it’s time to eat. Scouting out ingredients is half the fun of cooking. There are a few items in these recipes that you won’t find at your neighborhood Winn Dixie or Publix. 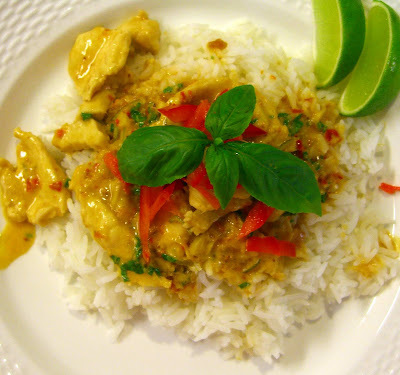 Let’s start with the Penang chicken curry (my recipe at end of post). 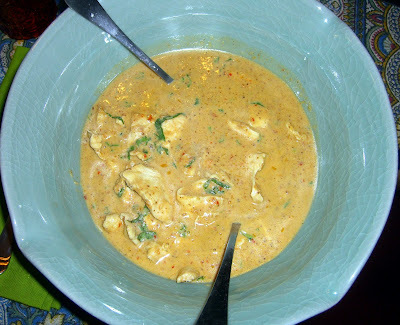 Penang curry gets its kick from the tiny red dried Thai chilies, sometimes called bird chiles, used in the curry paste. I felt like I hit the jackpot when I discovered the friendly Thai lady at Jacksonville’s Beach Boulevard Flea Market selling huge bags of dried bird chiles for $2 – a real steal, considering they’ve lasted me almost six months, and I put these chiles in EVERYTHING. (You can read a previous post I wrote about the Flea Market here.) 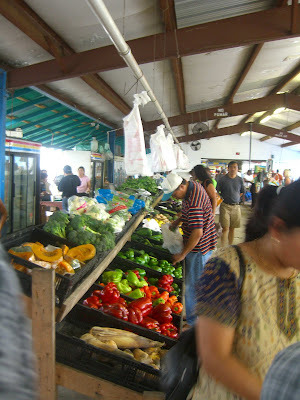 You can find a number of Thai and other Southeast Asian ingredients at the Beach Boulevard Flea Market. For my Thai meal, I found whole tamarind, Thai basil, kaffir lime leaves, lemongrass, bags of rice and heavy knobs of ginger – all at excellent prices. 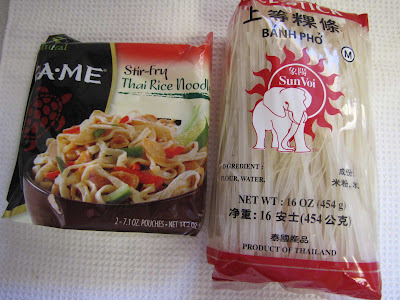 Since I'm still relatively new to town, there are many Asian grocers that I haven’t been able to visit, and I’m sure Whole Foods carries some Thai ingredients. I haven’t been there yet either, but I did get a chance to visit the Vietnamese grocery shop on the 5800 block of Normandy Blvd, near Big Lots and World Gym. They carry a lot of ingredients that are also used in Thai cuisine, such tamarind paste, Sriracha, fish sauce, and fresh lemongrass. 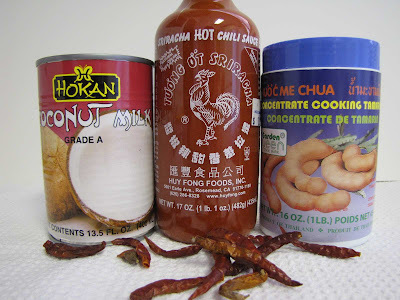 One ingredient for the Penang curry paste that I haven’t been able to find in Jacksonville is shrimp paste (if anyone knows where to buy it, please let me know!) 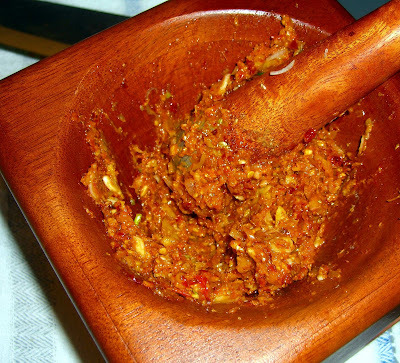 I’ve found that a suitable substitute is dried shrimp which I pound to a paste in a mortar and pestle. 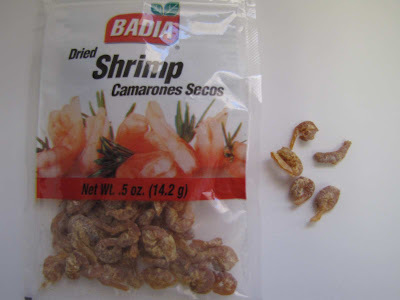 You can buy little bags of tiny dried shrimp in the Latino spice section of WalMart. I would never shop for fresh veggies or meat or dairy, or, really, much of anything at WalMart, but I was surprised at their Asian and Latino dry goods sections. The ingredients for pad thai are a bit easier to come across than those for Penang curry. 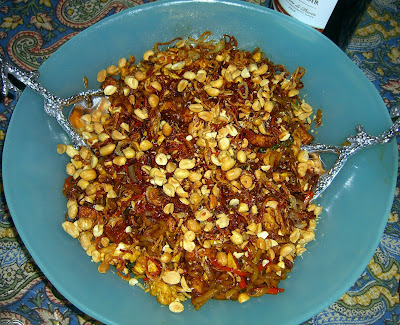 I adore this recipe for vegetarian pad thai from Gourmet magazine. You might be surprised to learn that you can find almost all of the dry goods for this recipe at World Market. I recommend you check out their food section if you haven’t already, as they carry Sriracha, fish sauce, bird chiles, chili-garlic sauce, coconut milk, Jasmine rice, and spices at good prices. Most important, they carry the dried flat rice noodles called banh pho that are crucial for pad thai (at right in photo). I’ve also used vacuum-packed pre-soaked rice noodles under the “Kame” brand that you can find in the ethnic foods section at Publix. As you can imagine, the texture isn’t nearly as good as the dried noodles and they don’t soak up the sauce as well, but they’ll do in a pinch. Serves 2 if eaten as the primary course. I double or triple it for a party. 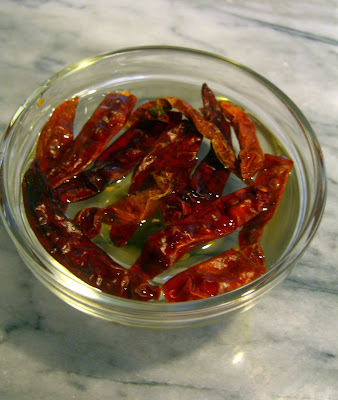 Place the chilies in a small bowl and cover them with hot water. Soak until they are pliable, 30 to 45 minutes, then cut them open and remove as many of the veins and seeds as you can. If you’re not used to handling chiles, you might want to wear latex gloves for this. Toast the cumin seeds, coriander seeds and peanuts separately until fragrant in a small nonstick saucepan over medium heat. It should take about 3 minutes for each. Allow the spices and nuts to cool, then grind them to a powder in a coffee or spice grinder. Set aside. Break out the mortar and pestle and add the chiles and a generous pinch of salt. Pound the chiles until the skins break down and they are transformed into a paste. Be patient – this takes some time and unfortunately you can’t cheat and do this in a food processor! If you are using dried shrimp instead of shrimp paste, remove the chiles from the bowl of the mortar and pound the dried shrimp until they too break down. Transfer the chiles to a mini food processor (you’ll need to use a full-size processor if you’re tripling or quadrupling the curry paste recipe). Add the lemongrass and galangal or ginger and process until smooth. You might have to add a splash of water to facilitate grinding. Add the cumin, coriander, peanuts, shallots, garlic, and shrimp paste and process until very smooth. Now you have your curry paste! Heat a well-seasoned wok or medium saucepan over medium-high heat. With a spoon, skim the coconut cream from the top of the can of coconut milk – you should see that the cream has risen to the top half of the can, while the coconut water remains at the bottom. Add the coconut cream to the preheated pan. It should bubble and sizzle. Add all the curry paste and fry, stirring constantly. If the paste seems too dry, add coconut water in 1 /4 cup increments. The paste should become fragrant after about 5 minutes, and you should start to see the solids begin to separate from the oil in the coconut cream. Once you see the oil rising to the top around the bubbles in the curry, add the chicken and stir for 1 minute. Add the lime leaves, brown sugar, and more coconut water until it reaches a desired consistency (it should be a thick curry, not too watery). Simmer, stirring, until the chicken is cooked through. Season with fish sauce and taste the curry. If you’d like it more salty, add more fish sauce. If it needs a little more sweetness, add another pinch of brown sugar. Remove the curry to a serving bowl and garnish with shredded lime leaves, lime wedges, and basil. A great chinese chef I know uses it in her recipe for peanut sauce (a few tbsp mixed with the peanut butter, cider vinegar, sesame oil.) I can look up the recipe and send to you if you like. That's what we use it for. Peanut sauce for noodles... I think Thai peanut sauce for satay usually has some coconut shavings mixed in the peanut sauce. I haven't found shrimp paste in Jax yet either, but like you, I've only been to a few Asian groceries - my sense is that their prices are somewhat higher than on the west coast, but that fact may be due to trucking it down here! 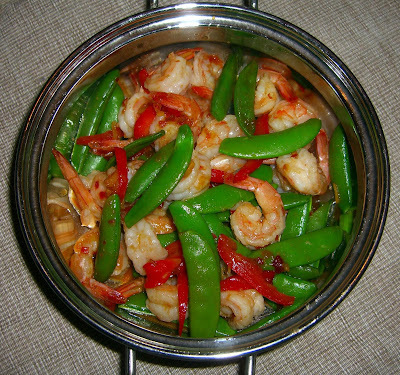 Your quick and dirty recipe for Shrimp/Sugar-Snap Pods sounds great - think I'll give it a try soon. Thanks for the idea. It was great meeting you and we should get together soon. There is a pretty big Filipino community in Jacksonville. You can find shrimp paste usually in any Filipino grocery store around town. We call it "bagoong"
I'm so glad you posted this! I never thought of the flea market for produce. The photos were great... can't wait to explore. I'm still trying to find frozen tamarind paste, which is supposedly available in Mexican markets. Don't know where a Mexican market would be in Jax. Haven't been to Whole Paycheck to source ingredients because it's hard to get out of there with my wallet intact. There used to be a hole-in-the-wall Asian foods store on University Blvd. south in a seedy strip-mall that had a few fresh items in a small cooler in the front of the store. Its biggest appeal was row upon row of shelving with canned, bottled, jarred, dried anything Asian you could think of. I see that area is trying to get gentrified now. Not sure if the little shop is there any more. There was a botanica in the same strip mall -- sort of a Home Depot for Santeria. **sigh** I miss those interesting stores. You're sure to find tamarind paste at World Food Mart, Mi Pueblo, or Apna Bazar. Good luck! Last week I thought I saw some of the Asians cooking herbs…..anyways I just want to tell you that your Blog might have help me find things that I need for my cooking.